I think the first time I really understood handheld music making was when I first tried Nanoloop on Game Boy. While the more-popular LSDJ tracker is powerful, Nanoloop’s interface was unlike anything I’d seen before: aggressively minimal, it embodies in its interface design the feeling of a blank sheet of paper. Adding an idea feels like composition, like genuinely exploring open-ended possibilities and discovering what melodies may result. Now, Nanoloop – already on iOS – is available for Android, too. It remains simple stuff, the sense of what a music maker looks like when designed for your hand rather than translated to mobile from desktop, studio-style workstations. There are six fixed channels, each assignable to a synth (FM, noise, or filtered wave) or a sampler. Then, each channel takes eight patterns. 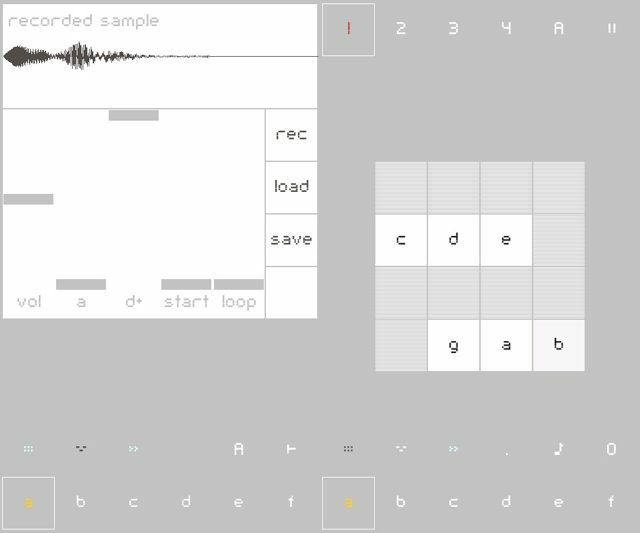 There’s a step sequencer, the ability to resample, and song editor with loops. The sampling capabilities are especially nice on Android, as you can now sample from the mic or load samples right onto the SD card. (The mic you can use on iOS, but not the SD card, of course.) You can export OGG files to your library, turning your Android device into a DJ-set-ready pocket music library, or send and receive projects via email. Via iTunes, you can even exchange files with the iPhone version, in case you have an Android phone and an iPod touch or some similar arrangement. This isn’t a port of the Game Boy nanoloop, developer Oliver Wittchow is quick to note. It’s not for chip music, or emulating game consoles. It’s for … well, Android music. But make no mistake: while the tool feels fresh and native to the new platform, it also carries the spirit of the Game Boy version. And that spirit is handheld music making, not just the aesthetics of the chip, but the feeling of using a minimal device scaled to your hands, something you can use on the go. Oliver tells CDM that he has used a lot of native code (via the NDK), as he did non-object-oriented C (not Objective-C) in the iOS version. He says it’s about 1:1 C and Java: “I could use the iOS code almost unmodified and get the sound engine and touch input to work immediately. I had an almost fully working nanoloop within few days – without any graphics though. The results, he says, are a little strange if you’re looking at the code (lots of getters and setters, C mixed with Java), but it works well. Nanoloop works on a variety of devices, including HTC Desire, Motorola Droid and also midrange phones such as HTC Legend and XPERIA X10 mini. However, this is the first release and of course it has not been tested on all Android devices yet. If you experience crashes or other problems, please report them via e-mail or the anonymous bug report form at www.nanoloop.com. Thank you. Now if we can just have some luck with Bluetooth MIDI at our hacklab tomorrow, this could be another candidate. Oh, and most of all, I’d love to hear the music you make. For the historical record, here’s nanoloop for Game Boy on CDM – from 2004. It’s actually come quite a ways since that release, but the spirit is the same.